A Wind Advisory has been issued until 6 p.m. in the Las Vegas valley. NV Energy reports 334 customer in the Las Vegas valley do not have power at this time. 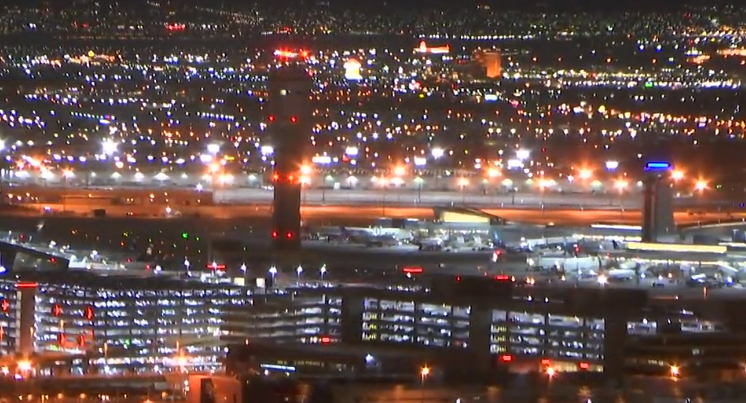 No major delays reported at McCarran International Airport. 13 Action News Reporter Austin Carter has the latest. UPDATE 5:30 A.M. April 10: A Wind Advisory has been issued until 6 p.m. on April 10 in the Las Vegas valley. NV Energy reports 334 customer in the Las Vegas valley do not have power at this time. For an update on outages click here. There are 40 mph gusts reported at McCarran International Airport. To check arrival and departure flight information at McCarran click here. UPDATE 4:30 A.M. April 10: Hi winds continue in the Las Vegas Valley. Guts as high as 64 mph at Echo Bay and 50 mph at Red Rock Canyon reported at 3:30 a.m.
Wind gusts at 3:30 a.m.
UPDATE 11 P.M. McCarran International Airport announced a Traffic Management Program was in place due to the high winds detected at the airport. The ground stoppage was in place for arriving air traffic, but overall delays at the airport were also reported due to the windy weather. The winds are expected to stay in Southern Nevada through Wednesday along with cooler weather conditions across the valley. The high managed to climb to 83°, then a cold front pushed in. Dropped to 62° by 11pm. We woke up to a warm 72 Tuesday morning, tomorrow (Wed) we will wake up to the mid 50s (average)! UPDATE 4 P.M. APRIL 8: A dust storm warning has been issued for Clark County in Southern Nevada. Drivers and the Nevada Department of Transportation are reporting limited visibility in the Primm area because of blowing dust. The wind that is causing that dust to blow around is headed towards Las Vegas. Click here for 13 First Alert Weather. LAS VEGAS (KTNV) -- The Las Vegas valley will be seeing a change in the forecast with high wind gusts bringing cooler temperatures to Southern Nevada. The forecast is calling for strong winds Tuesday, and Wednesday that will deliver a significant temperature drop. Gusts are expected to be up to 30 mph Tuesday morning, with 50-60 mph gusts through the afternoon hours with temperatures moving from the mid-60s to the low 80s. Blowing dust, trees and power line damage along with strong crosswinds are possible with a High Wind Warning in effect. The winds switch to the northwest Tuesday evening and will continue to gust up to 40 mph through Wednesday - dropping temperatures too the low 50s Wednesday morning and keeping the highs near 70 degrees. Thursday continues with the sunshine, but the below average temperatures are also expected to continue with north breezes ranging from 15-25 mph. Clouds are expected on Friday along with a few isolated showers around the valley along with the continued cooler temperatures. Winds are expected to relax on Saturday, but breezes of 15-25 mph return on Sunday with high temperatures moving back the mid-70s Saturday to low 80s on Sunday.